The way in which most international media houses report on death on the African continent makes it seem as if it was normal; to be expected. As if violence has its home on this continent. What is now known as the 2015 Baga Massacre in North-East Nigeria had a death toll of 2 000 people. The perpetrators of the killings was Boko Haram. Between 3 and 7 January 2015, a whole town was nearly wiped off the face of the earth. There was no requiem for them. And now almost no memory of them. No faces of those lost to that attack. Compare that to 7 January 2015, when the city of Paris experienced the Charlie Hebdo shooting, in which 12 people were killed. The hashtag #JesuisCharlie trended, with the French flag on Facebook profiles. Not even Nigerians knew about the Baga Massacre. After the Hebdo attack, world leaders came to France and declared their solidarity with the French people. In Nigeria, authorities were still denying that the Baga Massacre ever took place. For a continent where many have died as a direct result of the punitive measures of colonial armies, and the dead long forgotten, a certain narrative has been formed for us, which unfortunately we have accepted: that our lives and death are undeserving of the white gaze - whereas a singular death or shooting in Europe or America deserves our sympathy. There is no doubt that Africans are pushing against this narrative in a subtle way, demanding that our dead be remembered, not as dead only but as people who had full lives that had meaning and touched society. 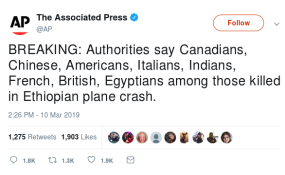 The Ethiopian Airlines crash was a tragedy. What was, however, even more unfortunate was how the Western media covered the crash. But for how long shall we complain about a problem that has become a pattern? The #SayTheirNames campaign was a direct response to the absence of the humanising of the Africans who died in that crash. Their stories were not just personal and emotional, but we also heard that some of our very best minds died in that crash. The details of these men and women who perished would never have been known if we had focused only on figures and statistics. Surely the necessary turning point in the narrative of our dead, from numbers and statistics to showing the faces and telling the personal stories to make an emotional connection with those who died and to honour them, is the responsibility of the press on the African continent.